We continue with Moses and start the 10 plagues! 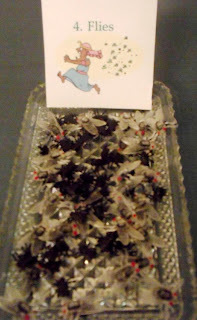 The 10 plagues was my daughter's favorite lesson she remembers me teaching as she was growing up! Some of the visuals I have used for years! I don't mind putting money into visuals, since they last for so long and they really make a huge impact for the kids! There is a small one page booklet for today's take-home. There are extra worksheets to review the plagues also. 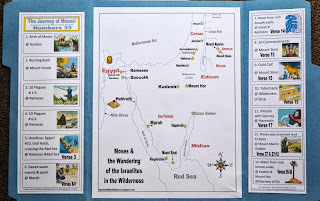 Review: God talked to Moses from a burning bush and God told Moses that he would be the person to talk to Pharaoh about letting the Israelites leave Egypt. Moses didn't think he could do the job. 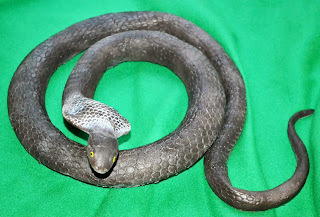 But God told Moses to throw his rod on the ground and it became a snake. Moses picked it up by the tail, and it turned back into his rod! Then, Moses put his hand in his bosom, and it came out leprous! God told Moses that if Pharaoh didn't believe the first 2 signs, then Moses was to pour water from the river onto the dry ground and it would turn into blood. God told Moses that Pharaoh would refuse to believe at first, but with God's power, Pharaoh WOULD believe. Since Moses was not sure he could not talk very well, God said He would send Aaron with Moses to do the talking. They were to tell Pharaoh that "I Am" sent them. 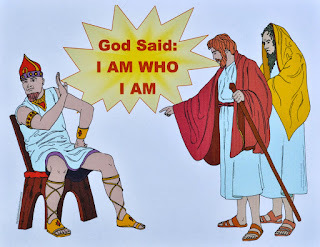 God said ' I AM WHO I AM'. Lesson in Exodus 5-9: And Moses was eighty years old and Aaron eighty-three years old when they spoke to Pharaoh. (7:7) Moses and Aaron went to see Pharaoh just like God told them to. They told Pharaoh to let the people go, and Pharaoh replied "I do not know the Lord, and I will not let the people go!" 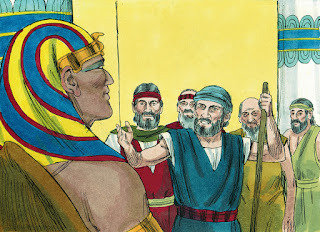 (5:2) Pharaoh asked why they took the people away from their work and the people needed to go back to work! Pharaoh had to decide a punishment because Moses and Aaron asked to let the people go. He decided to make the people find their own straw to make the bricks, instead of the taskmasters giving it to them... but, the people still had to make the same number of bricks each day! That was really impossible, and the people are upset with Moses because Moses made Pharaoh angry at them! God told Moses "I am the Lord. With a strong hand, Pharaoh will let the people go." 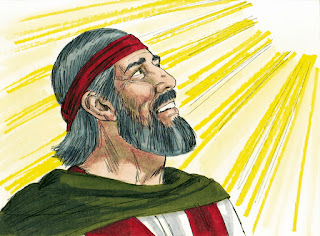 (Chapter 7) So, God sends the 10 plagues to show Pharaoh the His power! Pharaoh said have your God take them away and I will let the people go. All the frogs died except for the ones by the river. They gathered them all together and made piles of them and it stank! So, the problem was taken care of and Pharaoh changed his mind. 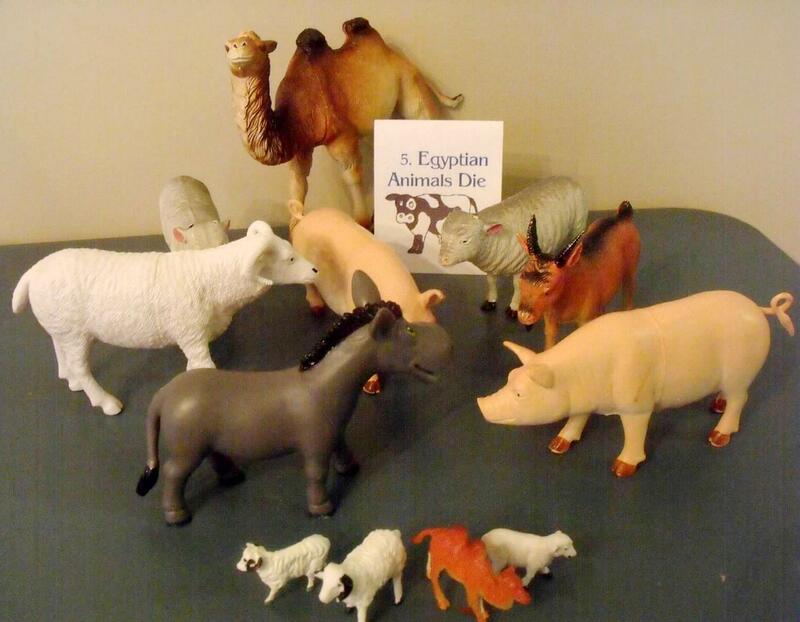 The livestock included cattle, horses, donkeys, camels, oxen and sheep. This is the beginning of the plagues that God sent. We will continue the 10 plagues next week! Next to each plague above, you will see the item that I gave to them highlighted in yellow. They will start the artist palette project and leave it in class for the 3 weeks. 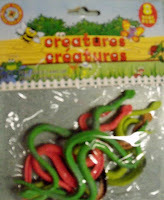 Also, they will leave the bag of 10 plagues goodies so we can review each week. I made a copy of the 10 plagues song for them to take home and asked their parents to sing it with them. 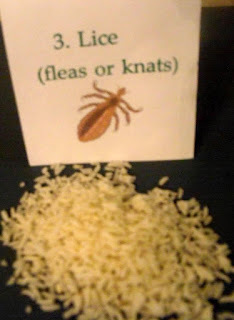 Each week for the 10 Plagues, I will have a new take-home project for the kids. For this week, I purchased these small artist palettes and the kids will add the plagues this week, and the next 2 weeks as we discuss them. I found these at hobby Lobby after wandering the store looking for something with 10 spaces and used my 40% off. But, if you do not want to purchase them, you can use the same printable and you can use on a paper plate, or by itself. I also put the pieces through my sticker maker, but if you are using the artist palettes, you could use the glue dots to attach everything. If you are using the artist palettes, you do NOT need to print the first page, just the second page. The second page is enough for 2 students! This next download has everything already on the circles, which is great for a teacher's visual or if you don't want to spend the time cutting and gluing. Also, it would be nice for younger children. Print it here. Click on visual to print. Then Moses and Aaron did so; just as the Lord commanded them, so they did. Here is today's Bible verse for students (6 per page). Here is the teacher's Bible verse visual (1 per page). Through and fun as always. Thanks for stopping by! I appreciate you having the linkup parties! Great way to help the little ones remember the plagues! Thank you so much for sharing! Kids love this Bible story! I think about it a lot when we experience small nuisances - like a few flies in the house. God definitely knows how to get his point across! Thanks so much for sharing at After School. Yes, I love teaching the 10 plagues! 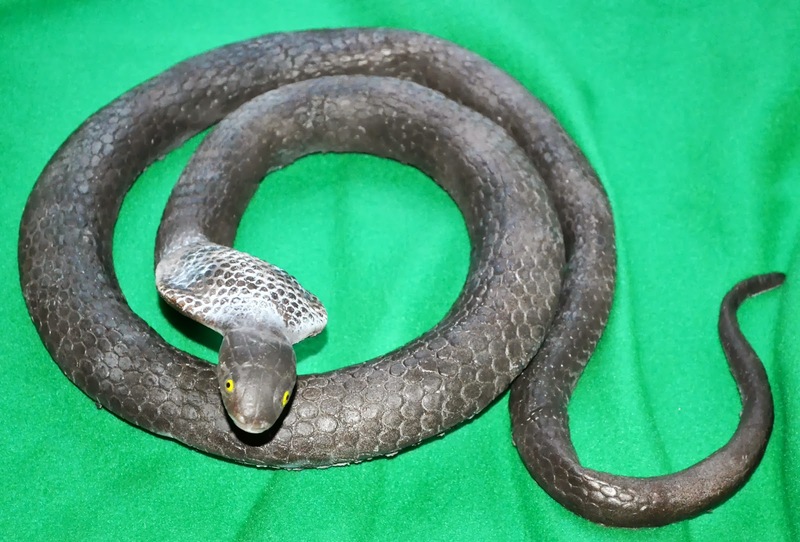 They are so much fun, and the kids love it! Thanks for visiting and leaving the nice comment! 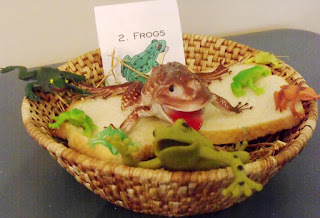 Your lesson looks like fun :) I found your post through Growing Home's Teach Me Tuesdays. Thanks for sharing! I came over from the hip homeschool hop. 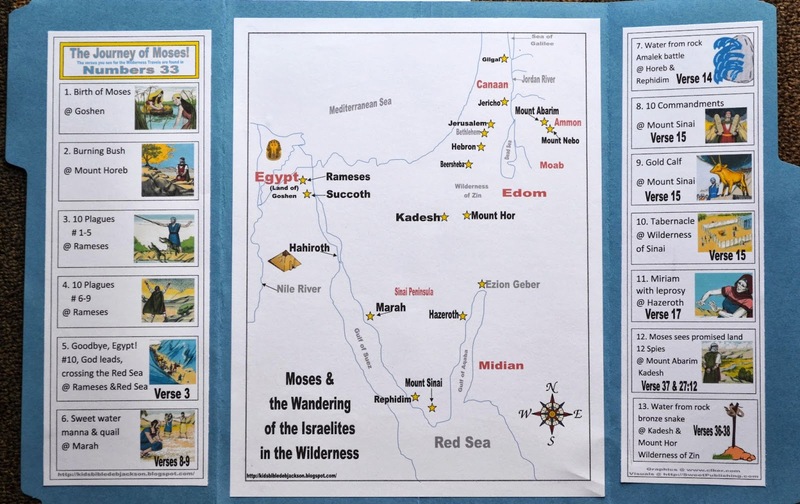 I am teaching Kindergarten Sunday school this year and some of these resources will be great when we get to the Moses lesson. Thanks! Thanks so much for the comment! I appreciate you visiting! I love the plague circle but aren't 6 & 7 flip-flopped? Boils then hail, right? Your site has been so helpful. I'm here to recommend you for this wonderful work.